My research group just published a study documenting that the implementation of state-wide smoking bans in California, Utah, Delaware, South Dakota, New York and Florida had little or no immediate measurable effect on deaths from heart attack (acute myocardial infarction, AMI). The study was published in the Journal of Community Health (here). 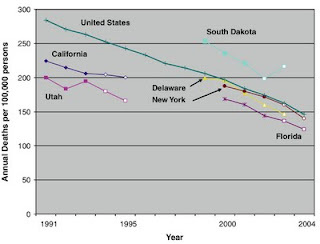 Nicholas Peiper, Phil Cole and I studied the AMI death rate in those states before and after smoking bans were implemented, comparing those rates to historical and national trends. The results are illustrated in the figure. The state-wide bans had no effect in California, Utah, Delaware or South Dakota (the AMI death rate actually increased almost 9% in South Dakota during the target year). But after bans in Florida and New York in 2003, AMI death rates declined 9% and 12% respectively, which exceeded the expected declines based on historical trends in those states. However, they were not significantly different from the 10% decline in the 44 states that did not have smoke-free ordinances in 2004. Since 2004 several published reports have claimed that smoking bans in small cities result almost immediately in reductions in heart diseases. For example, in Helena, Montana hospital admissions for acute myocardial infarction (AMI) declined 40%, from 40 before to 24 after implementation of a smoke-free ordinance (here). In Pueblo, Colorado, AMI admissions dropped 27%, from 399 before to 291 over a 1.5-year period following a ban, and the authors reported that the decline occurred “within months” of implementation (here). In Bowling Green, Ohio, hospital admissions for ischemic heart disease and heart failure fell from 36 before to 22 after a ban (here), and in Monroe County Indiana, hospital admissions for AMI among non-smokers declined from 17 before to 5 after a ban (here). But there are two problems with these claims. First, it’s dangerous to make big claims based on tiny numbers. Phil Cole and I presented evidence that the Helena and Pueblo findings “are consistent with random variation because of the small number of observations on which they are based.” (here). Second, none of the previous reports accounted for the long-term downward trend in heart disease in the U.S. In our study smoking bans might have taken the credit for the 9% decline in Florida and the 12% drop in New York if the historic drop in AMI that occurred throughout the U.S. in 2004 was ignored. The figure above shows the impressive decline in American heart attack deaths since 1991. A University of Louisville public health initiative is reaching out to thousands of adult smokers in Owensboro, encouraging them to quit with assistance from the unlikeliest of sources — tobacco. 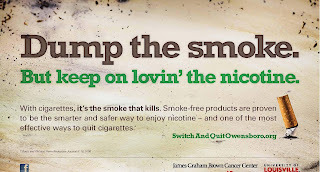 The “Switch and Quit Owensboro” campaign is based on scientific evidence that switching from cigarettes to smoke-free tobacco products provides almost all of the health benefits of complete tobacco abstinence. Switch and Quit Owensboro is the first community-based quit smoking program based on principles of tobacco harm reduction. Switching to a safer form of tobacco that satisfies smokers’ addictive desire for nicotine helps smokers quit cigarettes, and gain longer and healthier lives. The campaign includes print, radio, billboard, social media and cinema public service messages. 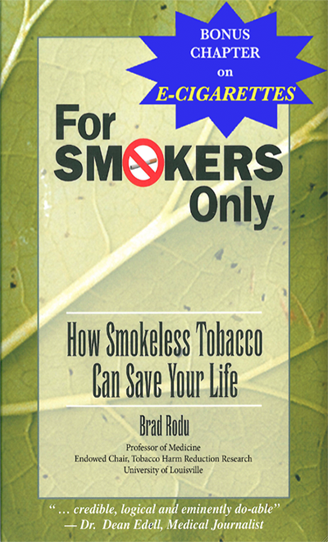 It is aimed primarily at adult inveterate smokers -- those who are unable or unwilling to quit using conventional approaches that emphasize total tobacco abstinence. At the start of the campaign, an astounding 15,000 cartons of cigarettes were sold per week in Owensboro/Daviess County. Cigarette sales should decline when smokers learn about safer, satisfying smoke-free substitutes. Visit the campaign website here. 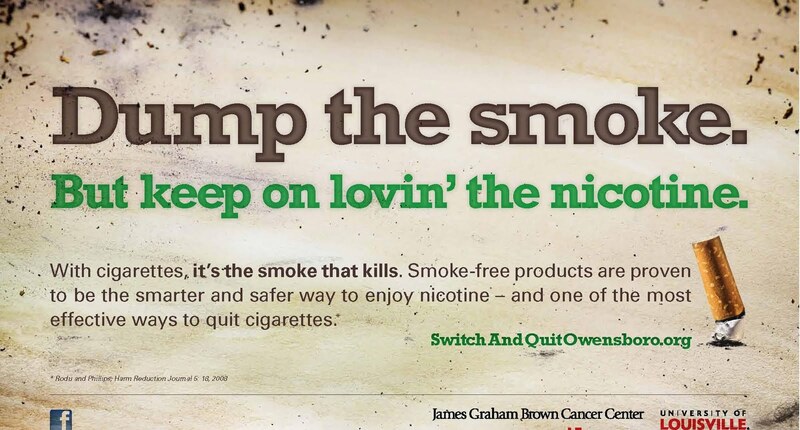 Switch and Quit Owensboro is a program of the University of Louisville James Graham Brown Cancer Center, which is committed to the prevention and treatment of cancer. The campaign aims to prevent the estimated 220 smoking-related deaths that occur in Owensboro and Daviess County, Kentucky every year. Surprisingly, the answer is either 45.3 million or 52.7 million in 2010, depending on which federal agency does the counting. This wide variance underscores the discordant findings from government smoking data. National statistics on smoking are provided by two federal surveys, the National Health Interview Survey (NHIS) and the National Survey on Drug Use and Health (NSDUH). I have conducted research on the differences between these two surveys (here) and I previously wrote a blog on the topic (here). Federal officials released fresh data from both surveys last week, making the discrepancies even more stark. The Office on Smoking and Health at the Centers for Disease Control and Prevention (CDC) counted 45.3 million American smokers, using the NHIS (available here). This number has not changed much in over 20 years. 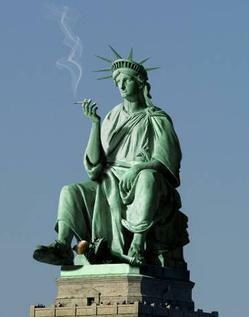 In 1990, the CDC reported that there were 45.8 million adult smokers. But as the U.S. population has grown, the percentage of smokers has declined. In 1990, smokers made up 25.5% of the adult population; by 2010, prevalence had declined to 19.3%. The CDC notes that, “If current patterns continue, smoking prevalence is projected to fall to approximately 17% in 2020, and the national Healthy People objective to reduce smoking prevalence to < 12% will not be met.” That’s an understatement. In 1998, the government set 2010 as the target for 12% smoking prevalence (available here). That proved to be a pipedream, and the 2020 goal will prove equally unattainable. One is reminded of Albert Einstein’s definition of insanity: doing the same thing over and over again and expecting different results. Last week, the Substance Abuse and Mental Health Services Administration, which administers NSDUH, released “selected” 2010 survey information (here). They estimated the number of smokers at a whopping 70 million, including teenagers, but they did not break out the number of adult smokers. The 2009 NSDUH survey reported 52.7 million adult smokers; the 2010 estimate likely will be similar. It is unacceptable that two federal surveys differ by over 7 million in their adult smoking counts. Even worse is the way the government uses the divergent data to spin different stories about smoking. They use the lower NHIS numbers to boast about declining smoking rates, which they attribute to higher taxes and smoking bans. They use the higher NSDUH numbers to argue for even more onerous anti-tobacco measures. My research (here) has explored why the NHIS and NSDUH estimates are so divergent. I have called for officials to investigate and resolve these problems so that national tobacco policy can be guided by accurate smoking data. When e-cigarette enthusiasts held a Vapefest in Philadelphia in March, Jonathan Foulds, a tobacco researcher at the Penn State University College of Medicine in Hershey, collected information from 104 attendees, using a 55-question survey. Dr. Foulds is the lead author on the resulting manuscript, published by the International Journal of Clinical Practice (abstract here). About three quarters of the users were men, with an average age of 34 years; almost 80% had not used a traditional tobacco product in the past 30 days. The average duration of smoking was 16 years, and they had smoked an average of 25 cigarettes per day. The average number of quit attempts was nine. Nearly two thirds of e-cigarette users had unsuccessfully tried FDA-approved smoking cessation medications, and three quarters had tried to quit “cold turkey.” Over half had used e-cigarettes for over one year. Most participants planned to continue using e-cigarettes for at least another year; they reported that the average weekly cost was about $13. The event attendees were e-cigarette enthusiasts, so it is not surprising that few of them used major brands that are widely available in convenience stores (such as NJOY and Smoking Everywhere). These brands have rechargeable batteries and replaceable cartridges. Instead, there was a preference for brands that have larger batteries with an extended life expectancy (eGo, Joye and Riva); the most experienced users preferred even more exotic hardware (Omega, Silver Bullet, Helix). Foulds and colleagues write that “we do not know enough about e-cigs to recommend them to patients.” Still, they must know that the “evidence” for evidence-based treatments is not compelling. Nicotine medicines have a 93% failure rate (here), and bupropion and varenicline are fraught with potentially serious side effects (here). Many health professionals wrongly believe that smoking is an illness requiring treatment. In fact, smoking is a lifestyle choice – albeit an addictive and risky one – for which people need satisfying and safer substitutes. This is the core philosophy of tobacco harm reduction, and of this blog.